Every day at 10 a.m. in the Downtown Eastside of Vancouver, the doors open at Insite, the only legal safe injection site in North America. The silence in the injection room, a sterile space with twelve shielded stainless steel tables in front of large mirrors, is broken by the noisy arrival of intravenous drug users, mostly homeless, ready for a fix. A nurse at the desk hands every addict a ‘hit kit’, a package of supplies to inject drugs in a safe manner: a clean needle and syringe, gauze, alcohol swabs, and a small hotplate. Drugs are brought by the user. Supervised by medical staff, addicts can inject safely, without risk of arrest or contracting an infectious disease. When they are done, they move on to a ‘chillout room’, before heading back out onto the street. It’s been going on like this for eight years, every day from 10 a.m. to 4 a.m. at Insite, the injection clinic in the Downtown Eastside of Vancouver, one of the roughest drug neighbourhoods on the continent. On average, 850 addicts per day come here to use safely – rather than in a back alley with a used needle and water from a puddle. The goal of the clinic, a pioneering initiative in North America, is so-called ‘harm reduction’: to reduce the spread of infectious diseases such as HIV and hepatitis among the thousands of addicts in the area, and prevent overdose deaths. An Insite worker prepares ‘hit kits’ in the injection room of the clinic in Vancouver’s Downtown Eastside. The pragmatic approach, familiar in Europe but still experimental in North America, will become permanent in Vancouver despite plans by the Canadian government to shut Insite down. The Supreme Court of Canada has rejected a cabinet plan to revoke the clinic’s exemption from Canada’s drug laws. The Conservative government of Prime Minister Stephen Harper wanted to close Insite, because the initiative goes against its strict drug policy, modeled on the American ‘war on drugs’. It weakens Canada’s prohibition of possessing hard drugs, the government has argued. But the High Court unanimously ordered the government to keep Insite open. The verdict is a painful defeat for the Harper government, which considers the clinic an encouragement of drug use. “We believe that the system should be focused on preventing people from becoming drug addicts,” said Leona Aglukkaq, Canada’s Health Minister. Nevertheless, the government will obey the court, she said in Parliament. Kerr published a study this spring in the medical journal The Lancet, which showed that the number of deaths from drug overdoses in the area has fallen by more than a third since Insite opened in 2003. It is one of over 40 scientific studies that have been done into the effects of the initiative. In Vancouver, former addict Dean Wilson is delighted about the verdict. He was a regular user of heroin at Insite between 2003 and 2009. “We always knew we were right, and we were vindicated,” he says. 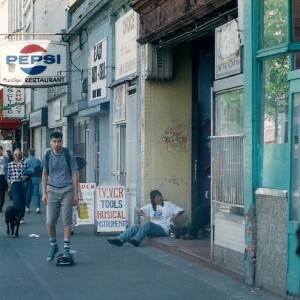 Vancouver’s Insite injection clinic opened in September 2003 in response to hundreds of fatal overdoses and a high level of HIV infections in the city’s Downtown Eastside, a rough neighbourhood where many drug addicts live, many on the streets. Canada’s Liberal government at the time granted Insite an exemption from federal drug laws despite sharp criticism from the United States. Washington still believes Insite should be closed, a diplomatic note leaked by Wikileaks recently revealed. 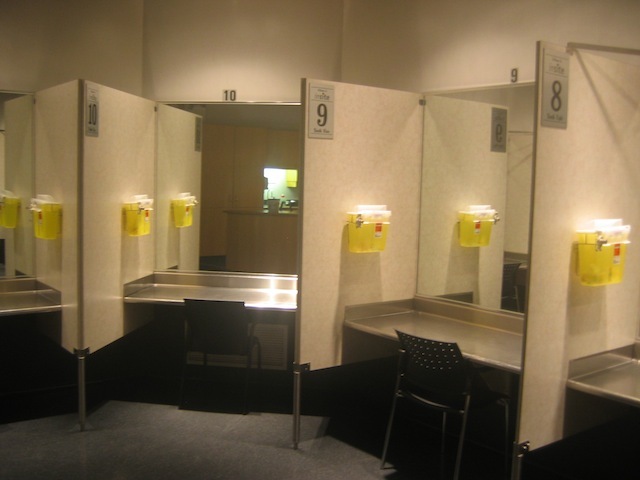 The safe injection site, modeled after similar initiatives in Frankfurt and Bern, among other examples, has since distinguished itself by its sheer size. Although more than 60 cities in the world have various forms of safe injection clinics, few have a daily average of 850 injections – with peaks reaching more than 1,100. Since 2003, 2 million injections have been performed at Insite. Medical staff can supervise the injections, but not administer them. Since the opening, there have been about 4,000 overdoses where medical staff intervened. None of those was fatal. In addition to the injection room, the facility also has a detox center on the second floor, and it offers transitional housing for addicts who seek treatment. More than 450 users accessed those services last year. In all, 12,236 individuals used Insite in 2010. Tables in Insite’s injection room. Vancouver’s Insite clinic is one of the most studied safe injection sites in the world. More than 40 scientific studies have been done into the impact of the initiative on overdoses, infectious diseases such as HIV, drug use, public order and crime in the neighbourhood. Insite has led to an increase of participation in addiction treatment, especially detox programs, according to a study in the New England Journal of Medicine. The clinic has led to a decline in the number of addicts who inject in the streets, and the amount of discarded injection materials in the area, according to a study in the Canadian Medical Association Journal. Insite has not led to a higher rate of return to drug use among former drug addicts, according to a study in the British Medical Journal.